6 Laboratory Safety AP Chemistry Mr. Callahan In order to make the laboratory a place of learning and discovery, it must be a safe place in which to work. Safety is everyone s responsibility. 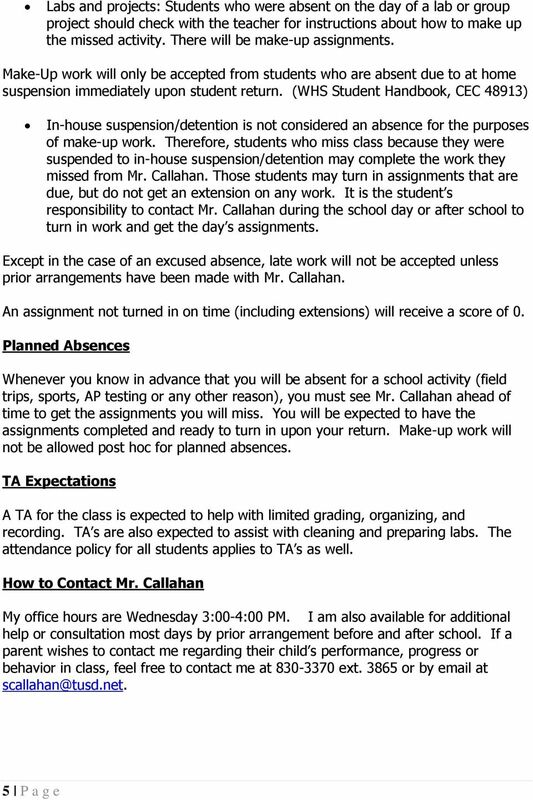 If you have any questions about safety or about laboratory procedures, be sure to ask Mr. Callahan. Electrical Safety Chemical Safety Caustic Substances 6 P a g e Never overload an electric circuit Make sure all electrical equipment is properly grounded Keep electrical cords away from areas where someone may trip on cords or where the cords can tip over laboratory equipment. Never unplug equipment by pulling on a cord. Before leaving the laboratory, be sure all electrical equipment is turned off and unplugged. Do not overpower equipment. Keep settings at those specified by the instructor. Do not short-circuit equipment. Never touch a possibly live circuit. Never taste any substance in the laboratory. Do not eat or drink from laboratory glassware. 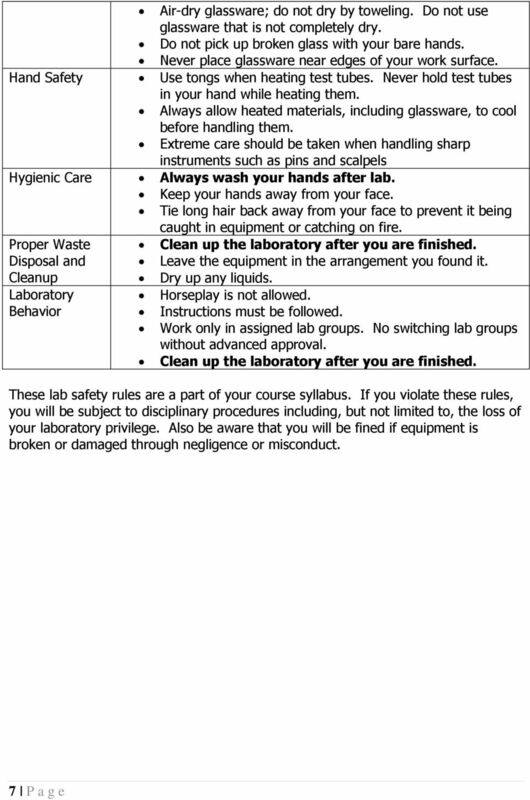 Do not eat or drink in lab. Properly label all bottles and test tubes containing chemicals. Never return unused chemicals to the original container. Alert your teacher to any chemical spills. Do not let acids and bases touch your skin or clothing. If a substance gets on your skin, rinse immediately with cool water and alert your teacher. If acids spill down the front of you, you must rinse in a full shower wash. Know where the emergency shower is! Wear your laboratory apron to protect your clothing When shaking or heating a test tube containing chemicals, always point the test tube away from yourself and others. Eye Safety Wear approved safety goggles in the laboratory when using chemicals of any kind, fire or when participating in a dissection. Know where the emergency eye wash station is in the lab. 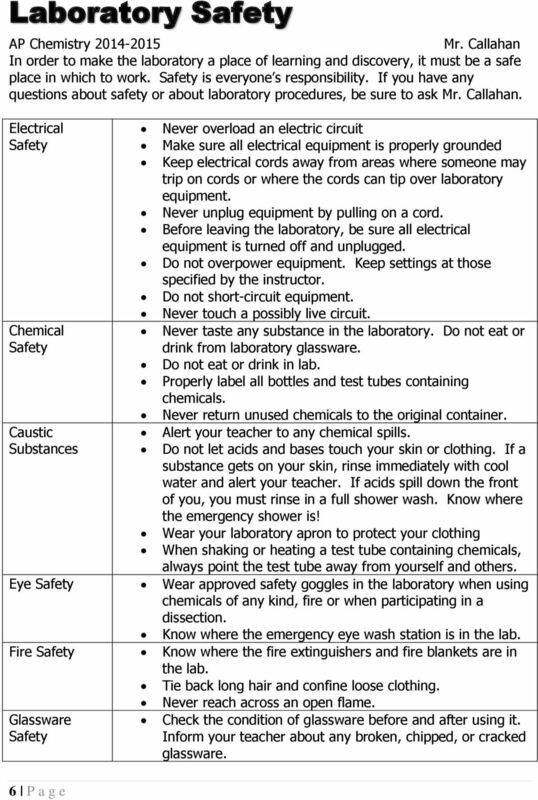 Fire Safety Know where the fire extinguishers and fire blankets are in the lab. Tie back long hair and confine loose clothing. Never reach across an open flame. Glassware Safety Check the condition of glassware before and after using it. Inform your teacher about any broken, chipped, or cracked glassware. 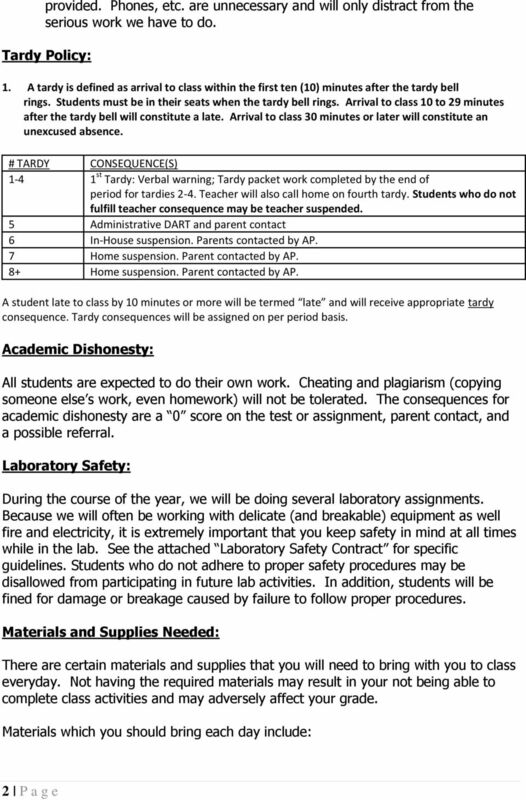 *The above rules are in addition to the classroom rules and procedures attached. SCIENCE EXPERIMENTS ON FILE Revised Edition 6.7-1 Conservation of Momentum Greg Kifer Topic Conservation of momentum Time 1 hour! Safety Please click on the safety icon to view the safety precautions. Elmira High School Communications I Mrs. Jeanie May Room 15 945-8200 ext. 304 before and after school and 12-12:30 e-mail: jmay@fernridge.k12.or. SCIENCE EXPERIMENTS ON FILE Revised Edition 4.6-1 Chewing Is Good for Digestion Gary Busby Topic Mechanical digestion Time 20 to 30 minutes Safety! Please click on the safety icon to view the safety precautions. 6 th Grade World History Mr. Casey (941) 330-1855 ext. 1209 Email: DanCasey@ssas.org All experience is an arch, to build upon. -Henry B. Adams Dear Parents/Guardians and Students, Hello! My name is Mr. WEB DESIGN SYLLABUS. Are you ready to create your own website? Demonstrate how you are an ethical and effective user of technology! WEB DESIGN SYLLABUS SCHOOL YEAR 2015-2016, Room 282 (Classroom) and 283 (Computer Lab) Are you ready to create your own website? CONTACT Mrs. Mary Ann Kurose Please feel free to contact me at any time. 5.27-1 SCIENCE EXPERIMENTS ON FILE Revised Edition The Boltzmann Distribution Lee Marek Topic Distribution of kinetic energy Time 30 minutes! Safety Please click on the safety icon to view the safety precautions. 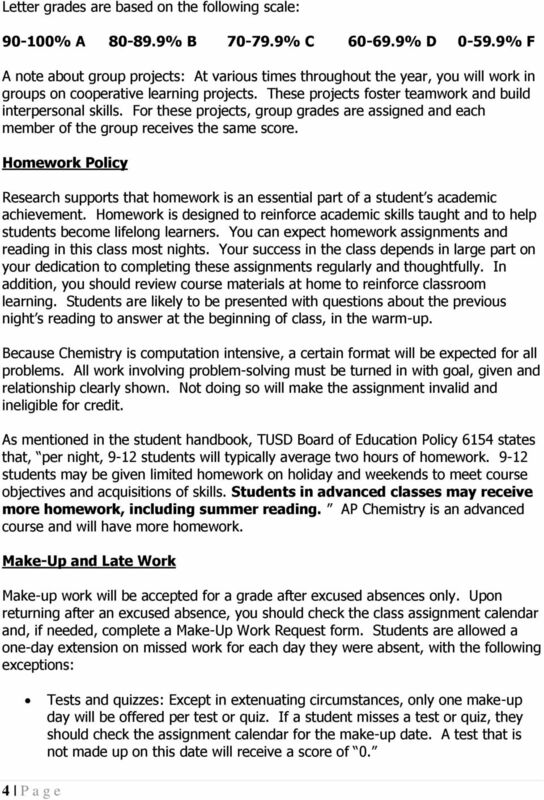 Northwest Career and Technical Academy Course Expectations 2014/2015. Human Development and Learning shauna_robinson@interact.ccsd. How do you digest milk? In this experiment you will test the ability of two substances, an acid and enzyme, to break down protein. Course Goals: Have science and engineering majors able to translate the theoretical concepts of Chemistry into concrete terms. FORENSIC SCIENCE SYLLABUS August 0-June 0 Instructor: Mr. McCartney Email: sgmccartney@cps.edu Phone: (77) -0 ext 86 Schedule: Classes meet, & Office Hours: By appointment or during 6 th or 8 th period. Welcome to Lincoln High School s brand new Translation and Interpretation class, the first in our school and District! 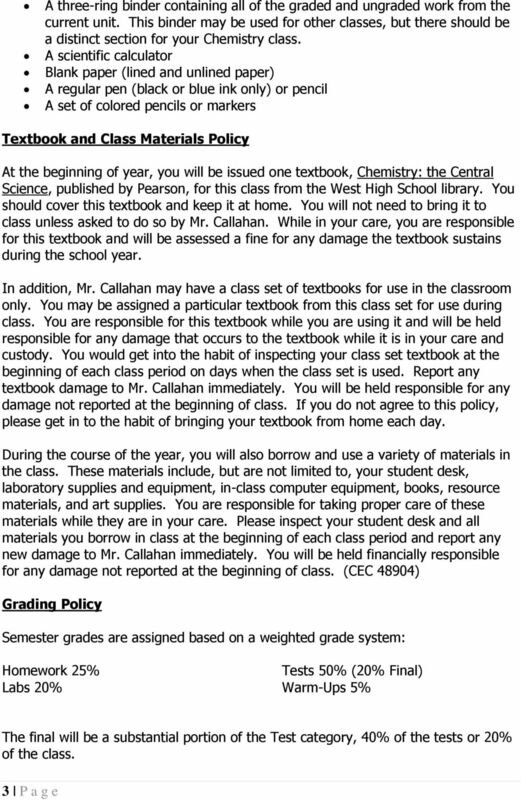 El Camino College Chemistry 1B: General Chemistry II. 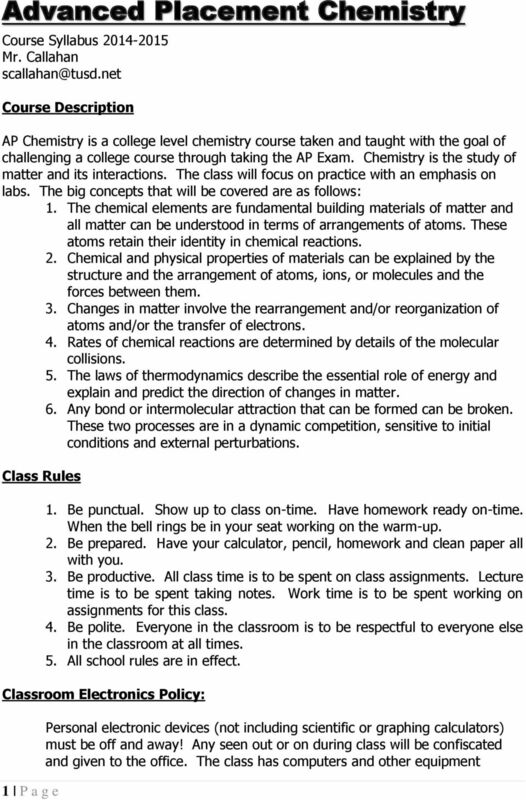 Instructor: Dr. Peter A. Doucette Office: Chem 122 email: pdoucette@elcamino. Wednesday 8-11 am and 1-2pm and Friday 8-1pm, any time I am in my office feel free to stop in.